FLORHAM PARK, N.J. (AP) Matt Forte won’t be grounded after saying the New York Jets should have used the ground game more. The veteran running back said he spoke Monday to offensive coordinator John Morton and coach Todd Bowles about his critical comments Sunday . Forte added that Morton was ”very open-minded” during their brief discussion. After New York’s 25-20 loss to Atlanta , Forte said the Jets ”strayed” from the game plan – which was to run the ball in the rainy conditions at MetLife Stadium. Forte finished with just 7 yards on four carries, while New York totaled 43 yards on 22 attempts – for a paltry 2 yards per run. 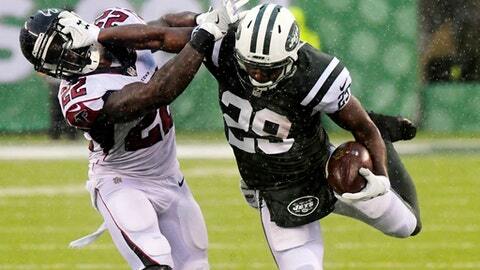 Bilal Powell led the Jets with 33 yards on 14 carries. Elijah McGuire had one run for 2 yards, and wide receiver Robby Anderson gained 1 yard on an end-around. ”Our game plan was fine,” Bowles said. Forte said he expected one of the running backs to get at least 20 carries, and thought moving away from the run-heavy approach hurt the Jets. When a reporter asked another follow-up question, Forte bristled. Bowles downplayed Forte’s comments, saying the running back’s emotions got the better of him after the Jets’ third straight loss. Although Forte said he spoke to Bowles, the coach said there was ”no need” to talk to him about his comments. When pressed on whether he was OK with Forte making those comments, Bowles made it clear he was moving on. ”I think it’s a waste of my time to even talk about it,” the coach said tersely. The Jets (3-5) enter their game Thursday night against the Bills (5-2) ranked 23rd in overall offense, including a running game that is tied for 22nd. New York’s passing offense hasn’t been much better, ranking 23rd in the league. Quarterback Josh McCown echoed Forte’s sentiments that Morton, in his first season as an offensive coordinator, is receptive to input from players on how to improve the unit. McCown ranks third in the NFL with a 70.5 completion percentage, and has a league-leading 75.6 completion percentage on third down. He thinks the offense is still very much a work-in-progress under Morton.